The ham in this case is smoked boneless ham from Flying Pigs Farm, in upstate New York. Prosciutto crudo is an acceptable substitute. Either pancetta or guanciale are other possibilities. Can’t help you if you’re pork-phobic. Pork has a transformative power to turn anything delicious. Brown onion in melted butter over medium heat, about 5-6 minutes. Add ham and asparagus; cook for about 3-4 minutes, stirring occasionally. Check seasoning. Fold in cooked pasta and asparagus tips, along with 1 T. reserved pasta water. Toss. 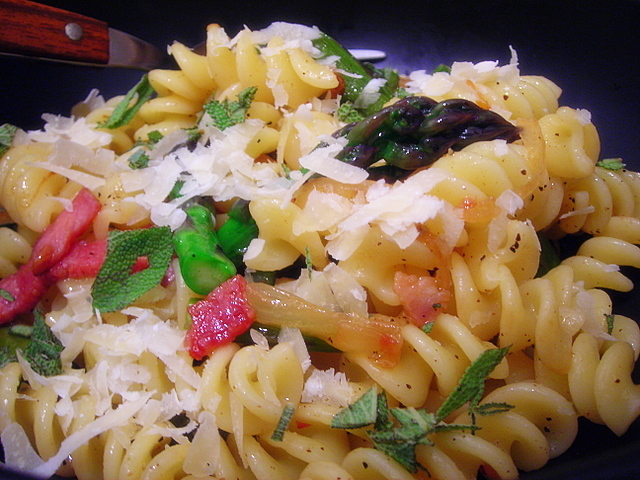 Top with grated cheese and herbs, and serve immediately. 08 May	This entry was published on May 8, 2008 at 4:23 am and is filed under food, general. Bookmark the permalink. Follow any comments here with the RSS feed for this post. I have to agree about pork products. They are just full of delicious. I go every other week. In fact, my next excursion will be next weekend (5/17). As I see it, brunch, then USGM, then home, then a jaunt to the bakery, then I’ll head to Bear Hill.